A wise or skilful man. The word is generally used to designate a cultured and learned person: "He who says a wise thing is called a wise man ["ḥakam"], even if he be not a Jew" (Meg.16a). Hence in Talmudic-Midrashic literature wise and learned non-Jews are commonly called "ḥakme ummot ha-'olam" (the wise men of the nations; Pes. 94b, and passim). "Ḥakam" as an official title is found as early as the first Sanhedrin, after the reconstruction of that body, when the Hadrianic religious persecutions had ceased; in addition to the nasi Simon b. Gamaliel, two other scholars stood at the head of the Sanhedrin, namely, R. Nathan as Ab Bet Din, and Meïr as ḥakam (Hor. 13b). Another ḥakam mentioned by name was Simon, the son of Judah ha-Nasi I., who after the death of his father officiated as ḥakam with his elder brother, the nasi (Ket. 103b). Just what the functions of the ḥakam were is not clear. Rapoport's suggestion that he was the arbiter in matters of ritual prohibition and permission is highly improbable. Zecharias Frankel looks upon the ḥakam as a presiding officer whose duty it was to examine a case in question from all points of view, and, having summed up the results, to present the matter for discussion. It is more probable, however, that the office of ḥakam was created in order to secure a majority in cases of difference of opinion between the nasi and the ab bet din in the affairs of the Sanhedrin; one of the most eminent scholars was always chosen for the post. A baraita (M. Ḳ. 22b) leads to the inference that the ḥakam was always the director of a school ("bet ha-midrash"), for in addition to the Great Sanhedrin, which later came to take the place of an academy, there were also private academies under the direction of eminent scholars. The origin of the office of ḥakam is as doubtful as its duration. Frankel thinks that Joshua b. Hananiah, who lived in the beginning of the second century C.E., was the first ḥakam, but he does not sufficiently support this assertion. The office seems to have existed in Palestine as long as the academy of the nasi. An amora of the fourth century recounts the following rule of etiquette, still observed in his time: "When the ḥakam appears in the academy every one present must rise as soon as he comes within four ells of him, and must remain standing until he has gone four ells beyond" (Ḳid. 33b). It is hardly possible that the office of ḥakam existed in Babylonia, where the relation of the resh galuta to the heads of the academy was entirely different from that existing in Palestine between the latter and the nasi. 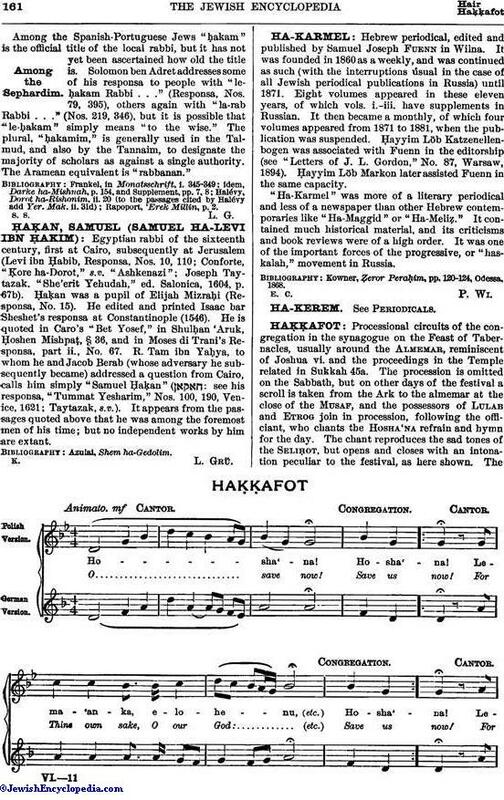 Here "ḥakam" was merely the term for a Jewish scholar who studied chiefly oral traditions, while the terms "sofer" and "ḳara" were applied to Bible scholars (Ḳid. 49a, b; Soṭah 49a; Yer. Soṭah ix. 23b; Yer. Ta'an. iv. 68a, where "ḥakkim" is used ironically for the ḥakam of the academy). In the Seder 'Olam Zuṭa ("M. J. C." ed. Neubauer, pp. 71 et seq.) every resh galuta is accompanied by a ḥakam, who probably had charge of the religious affairs of the exilarchate; but as this work originated in Palestine (comp. Seder 'Olam Zuṭa), the author probably applied Palestinian conditions to Babylon. The Syrian Aphraates, who had met only Babylonian Jews, mentions a man "who is called the 'ḥakkima' of the Jews" ("Homilies," xxiv., ed. Wright, p. 394), but this, too, may mean "the wise man" of the Jews. 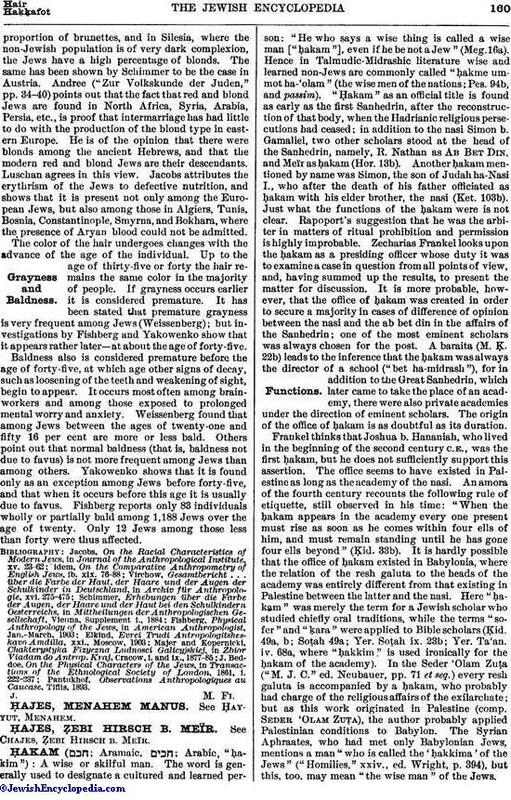 Among the Spanish-Portuguese Jews "ḥakam" is the official title of the local rabbi, but it has not yet been ascertained how old the title is. Solomon ben Adret addresses some of his responsa to people with "le-ḥakam Rabbi . . ." (Responsa, Nos. 79, 395), others again with "la-rab Rabbi . . ." (Nos. 219, 346), but it is possible that "le-ḥakam" simply means "to the wise." The plural, "ḥakamim," is generally used in the Talmud, and also by the Tannaim, to designate the majority of scholars as against a single authority. The Aramean equivalent is "rabbanan." Rapoport, 'Erek Millin, p. 2.